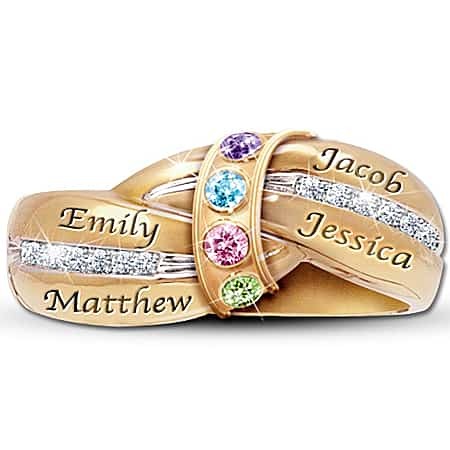 Family Rings for Mom - 10 Personalized Rings Mom Will Love! Are you shopping for family rings for Mom? Then you’ll want to check out this amazing collection of rings that are perfect for celebrating the love a Mother has for her children. Family rings for mothers are some of the most popular gifts for Mother’s Day, Christmas, and birthdays, and are a gift that any woman will treasure for years to come. A Unique Ring Mom Will Love! This sentimental ring is sure to become Mom’s favorite piece of jewelry! Solid sterling silver ring features 24k gold plated accents. 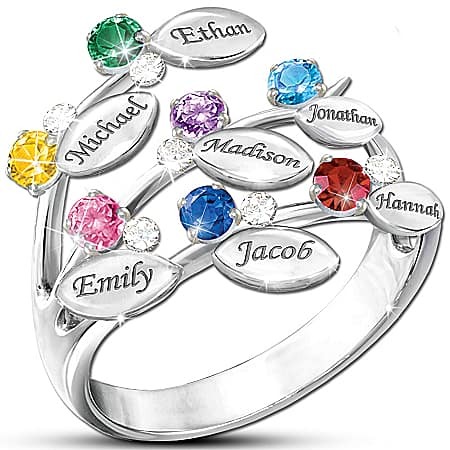 Up to 6 children’s names and birthstones are nestled in the elegant swirls. that’s engraved inside the ring. Mom’s love for her family shines as bright as a diamond, so this gorgeous diamond family ring is a perfect choice! Solid sterling silver ring is accented with 18k gold plating. Six genuine diamonds add sparkle and shine. Engrave up to 6 family member’s names on the braided design. “Our Family is United by Love”. Priced at under $125, this is a ring that will be cherished for generations to come. This simple yet elegant family ring is a classic that your wife, Mom, or Grandma will treasure for a lifetime. 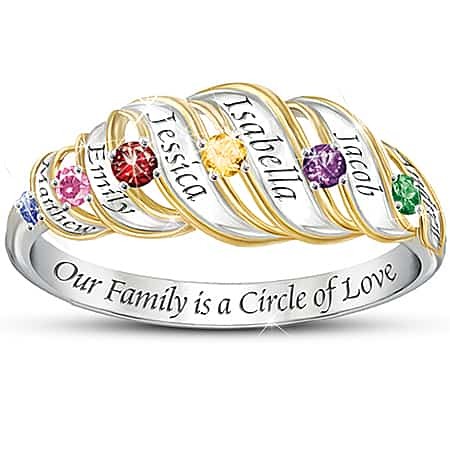 Customize this beautiful family ring by adding up to 6 birthstones. You can choose standard stimulated stones, or order genuine stones for $30 more. You also have the choice of yellow gold or white gold in either 10k or 14k. If you need a beautiful ring quickly, you can have this one customized and sent to you via overnight mail – it can arrive in 2-3 days. Mother holds your heart in her hands in this reasonably-priced ring! Lovely open heart sterling silver ring can hold up to 6 Austrian crystal birthstones. Each family member’s name is then engraved alongside the corresponding birthstone. This inexpensive ring is sure to be Mom or Grandma’s favorite gift this year – and you’ll love knowing that you bought an amazing gift. This takes about 3-4 weeks to arrive, so be sure to order in time. It’s also available in 18k gold plated if you’d prefer. Are you the type who prefers the casual elegance of sterling silver jewelry? Then this stunning personalized ring in silver is an excellent choice. Up to 4 family member’s heart-shaped birthstones are nestled against a shimmering row of genuine diamonds. A unique (and affordable) way to honor Mom’s love for her family! 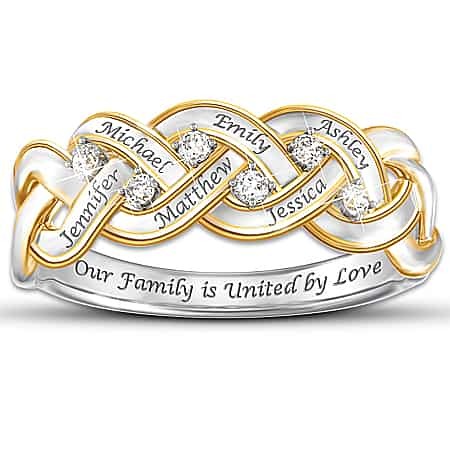 Your family is unique – your family ring should be one-of-a-kind also. 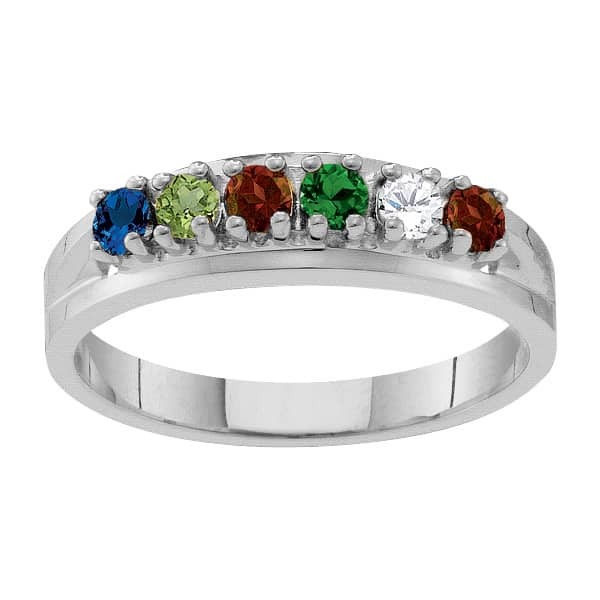 Each member of your family sparkles in this lovely family tree birthstone ring! Each leaf is then paired with the matching cubic zirconia birthstone with clear CZ “dewdrops” added for extra sparkle. The ring is handcrafted out of solid sterling silver and arrives in a custom gift box. Easy-to-use design tool lets you place each name exactly where you want it on the family tree ring – it takes just minutes to create a ring that’s sure to be treasured for years to come. You don’t have to pay a fortune to get a ring that your mother will enjoy! This delightful delicate heart-shaped ring is priced at well under $50. Add up to 7 Austrian crystal birthstones to create a beautiful piece of jewelry just for Mom! 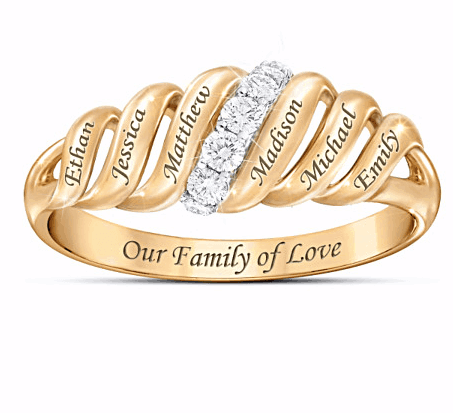 Wrap Mom or Grandma in love with this fabulous personalized ring that has been featured on Lifetime Television’s “The Balancing Act”. Crystal birthstones are set into the center band, which wraps around the entire ring in a loving embrace. You can use Bradford Exchange’s easy-to-use design tool to arrange the names and gemstones in any order you desire, and you’ll get a chance to preview your design before you buy. Contemporary ring is available in both sterling silver or gold-plate. Remind Mom or Grandma of the precious bond your family shares! Striking 18k gold-plated family ring showcases up to 6 engraved names and is highlighted with a row of 6 gleaming genuine diamonds. The inside is engraved with the secret message: "Our Family of Love". Stackable rings are all the rage right now. You can combine several stackable rings to create your own, one-of-a-kind family ring. As your family changes, so can your ring when you order stackable family birthstone rings. This delicate stackable family birthstone ring on the right is sure to please any Mom or Grandma! These rings look stunning individually, but their slim size (3 mm) makes them comfortable to wear in sets. Each ring features a genuine birthstone surrounded by the name and birthdate of the loved one. This stackable family ring is also available in ﻿﻿﻿﻿﻿g﻿old plat﻿﻿﻿e. Ring Size: These can be worn on any finger that the woman likes. If you don’t know her ring size, you can use this handy Ring Sizer. Type of Metal: These pieces are available in just about any type of metal. Most women have a preference for either silver or gold tones – just look at her existing jewelry to see what she prefers. You can also order two-tone rings that go well with both silver or gold. Quality of Birthstones: You’ll need to decide whether to get synthetic or genuine birthstones. Genuine birthstones are generally more expensive. Price: Personalized jewelry can start at under $20 and run into the hundreds, depending upon the type of metal and quality of the birthstones you choose. You’ll want this gift to be cherished for years to come, so try to get the nicest ring you can afford. Delivery Time: These items are custom orders, so they usually take at least 2 -3 weeks to be shipped. If you order at least 6 -8 weeks out, you should be able to get your ring without having to pay any express shipping fees. Return Policies: Check each website for details. However, since these are custom made to your specifications, generally the retailer will only allow returns if they’ve made a mistake. Be sure to double check that you have the correct birthstones and spelling before you place your order.